Getting on a plane for the first time can understandably give you the jitters. It's tough not to feel a bit out of sorts when you realize you're about to pierce through the sky, miles above the earth, in a tiny metal tube. Though fortunately most people don't get as confused as one first-time flier did last weekend when he mistook an emergency exit for the bathroom door, tried opening it in mid-air, and freaked the hell out of out everyone else on board. During a GoAir flight from New Delhi to Patna, India on Saturday, one novice passenger in his mid-20s got up to use the restroom. However, rather than approach the lavatory door, he unintentionally tried prying open the emergency exit, which understandably caused a bit of a panic among the rest of the passengers. A few of them promptly intervened, which is when he tried to explain himself. According to one official, the man simply "needed to use the washroom urgently,” but got confused since it was his first time on an airplane, per a report in The Telegraph India. Though that didn't quite quell all suspicion, and someone alertdd the crew, who intervened and kept an eye on him for the remainder of the flight. Once on the ground, the man was taken off and questioned by authorities, who found him to simply be a harmless, nervous flier. 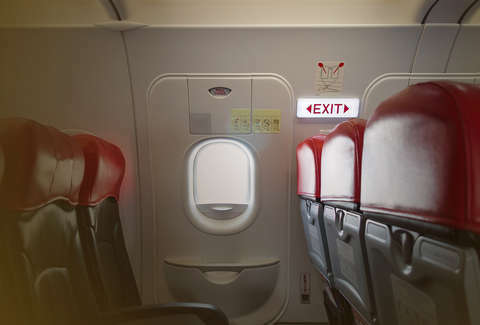 Thankfully, asTravel & Leisure points out, even though the fellow passengers were reasonably freaked out by what was happening, it's practically impossible for anyone to physically crack open an emergency exit door mid-air, due to the extreme difference in pressure between inside and outside the vessel. Still, just goes to show that it's never a bad idea to listen up when the flight attendants are pointing out where your exits are before take-off.